Dermal fillers can be used to replace lost volume or plump areas like the cheeks or lips, but they can also be used to non-surgically correct the shape of the nose. Dermal fillers are injected into strategic points on and around the nose to correct issues like undesirable folds or flatness, a bump or hook on the bridge, asymmetry, or a crooked appearance. Treatment with dermal fillers may also be combined with wrinkle injections, depending on the needs of each individual client. At Omniya we work only with the most advanced range of dermal fillers, using brands such as Allergan (Juvederm), to correct the shape of each individual’s nose, creating lasting and natural-looking results. Our Aesthetic Practitioners are medically trained artists, using the natural shape of your nose to achieve the desired results. How can nose correction help me? 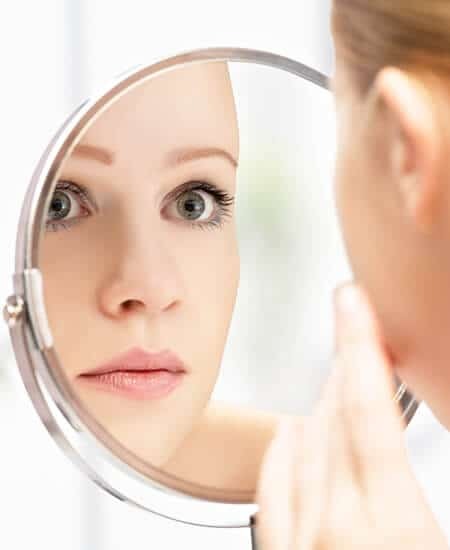 If you have unwanted bumps or ridges on the bridge of your nose, asymmetry, or a crooked appearance to your nose, then targeted dermal filler injections could help correct these issues. In some cases and depending on your current natural nose, you may also require wrinkle injections to achieve your desired result. All of our treatments are tailored to each individual client, so we can discuss your natural nose shape and possible treatment plan at your initial consultation. Am I suitable for nose correction using dermal filler? Your medical history will be discussed during your initial consultation, where before and after photographs will be taken. Your practitioner will assess your natural nose shape and advise on what is best for you. Your treatment will be explained in depth at the consultation, and we will only proceed once we are confident we can meet your expectations, with your consent. A side effect can be very light bruising. Lasting up to three days, medically this bruising process simply occurs as healthy bloodstream works to instantly treat the broken skin tissue from the injection point. This is temporary and lasts normally anywhere from 3 days up to a week. It should be noted that other interference issues may also provoke bruising including medications, lifestyle and alcohol. Swelling and redness may also appear. These side effects typically only last a few days. A topical numbing cream is applied and small quantities of dermal filler and potentially wrinkle injections are injected into targeted areas on and around your nose. The most important aspect of your treatment, in conjunction with the products, is the practitioner carrying out your treatment. At Omniya, we only work with medically trained, experienced and skilled medical practitioners. The effects of your nose correction treatment are immediate, but you may experience 2 days of downtime to let some minor swelling and slight bruising subside. Is nose correction using dermal fillers safe? All non-invasive procedures carry a small amount of risk, which is why we only administer them after a face to face consultation, during which a full assessment will be carried out and detailed cautions and contraindications are discussed. However, by nature Dermal Fillers are a safe procedure and a leading option to non-surgically correct nose shape. Please ask your practitioner for more information.